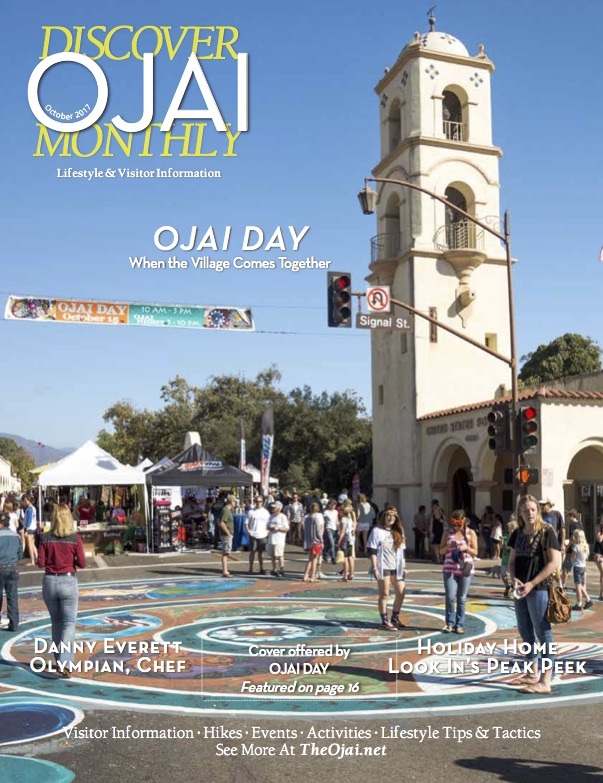 However, there is one anniversary being celebrated at the 2017 Ojai Day, the 25th anniversary of the Ojai Day mandala, the community-created design that will cover the Ojai Avenue/Signal Street intersection. Work begins at 9:00 p.m. on October 20, ending by 4:00 a.m. This year there will be an additional mandala-related activity. “We are doing a special event on the anniversary of mandala,” Young says. “We’re inviting artists from Ojai to do mini-mandalas on Ojai Day in the Libbey Park fountain area.” The mandala group also designed the 2017 Ojai Day poster. Entertainment during the day takes place on several stages, including the Ojai’s Own Stage on Ojai Avenue, presenting local musicians, this year including Smitty and Julija. The Matilija Junior High School band will perform on the Mandala Stage on South Signal, and the Nordhoff High School Dancers will perform. The Gypsy Gazebo stage in Libbey Park will be home to Hamsa Dance studio, with belly dancing and Middle Eastern Music. Vendors will be plentiful, according to Ojai Day Vendor Liaison, Carla Flores. These include the Ojai Optimists, selling tri-tip sandwiches, and the Ojai Lions Club, with their traditional Beer and Wine Garden and barbecue. Other vendors include All American Softy Ice Cream. “They are super fun for kids,” Flores says. Summit School will sell Avocado Bowls, and Wild at Heart will feature their fermented foods and beverages. Me Gusta Tamales will be among the food booths, and there will be several food trucks. The Turtle Conservancy will be on hand too, Flores says. “They usually have live tortoises and provide information and awareness. They sell T-shirts to raise funds.” The Ojai Music Festival, Ojai Sanitary District, and American for Safe Access will also have information concerning their programs. Other booths feature hand-crafted products, such as animals and dolls crocheted by Linda Killingsworth; Natural Body and Bath Soy Candles; and Mindful Mixtures, with handcrafted essential oil mixtures. Additional activities include the Historic Preservation Commission’s tours of the historic Ojai Jail in Libbey Park. Ojai Trolley Services will be free during Ojai Day, and the Ojai Green Coalition will provide free bicycle storage at their bike valet station.